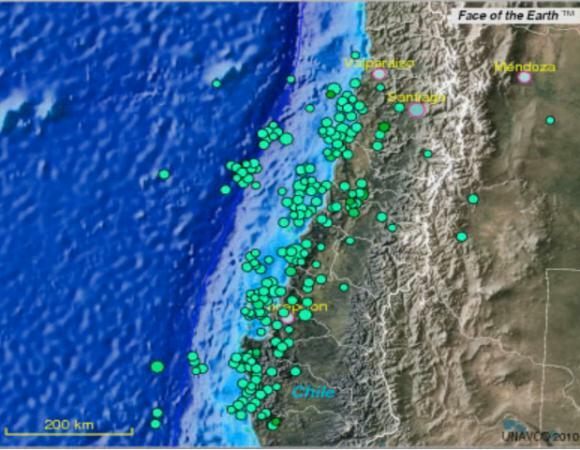 A magnitude 8.8 earthquake occurred on February 27th, 2010 at 3:34 AM local time (06:36 UTC) off the coast of the Maule region of central Chile (Figure 1). Intense shaking lasted for about three minutes and a tsunami generated in the Pacific Ocean. 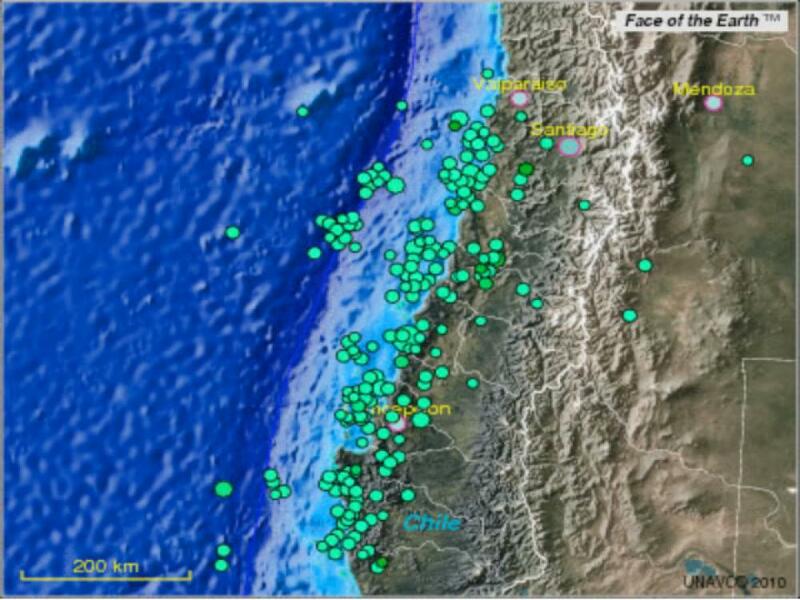 This event was just north of the rupture zone of the magnitude 9.5 Chilean earthquake of 1960 (the largest earthquake recorded to date) and is the fifth largest earthquake on record. Although this event was much stronger than the January 2010 magnitude 7.0 earthquake in Haiti it caused substantially less damage due to the more earthquake-resistant infrastructure and lower population density of the affected area. PBO staff were involved in the rapid response to this large earthquake in a number of ways. Adrian Borsa led the UNAVCO event coordination effort, which included a review and edit of all web content related to the event response, communications with community members, coordination of the initial phase of the rapid proposals until the PIs could take over, and the management of the transport of people and equipment to the staging area in Chile. GPS operations manager Karl Feaux traveled to Santiago, Chile with UNAVCO field engineer Nic Flores to deliver 20 GPS systems (combination of Topcon GB1000 and Trimble NetRS systems) and nine Tech 2000 fixed height antenna masts provided by the Plate Boundary Observatory.